Hey, I can see the Bridge to Nowhere from my house! (SitNews) Ketchikan, Alaska - Just the other day a visitor asked me about the Bridge to Nowhere. Specifically, he wanted to see it. Like former Governor Palin, the Bridge to Nowhere just refuses to go away. I personally would love to see the Bridge to Nowhere get its own commentary spot on Fox News. I bet it would have a lot to say. Especially about the former Governor. Of course, I could have spent some time explaining to the interested gentleman that the proposed Ralph M. Bartholomew Veterans Memorial Bridge is not a bridge to nowhere, it is a bridge to the future for our community. This Bridge No Longer Exists - the Hickory Bridge was a four-span through truss. 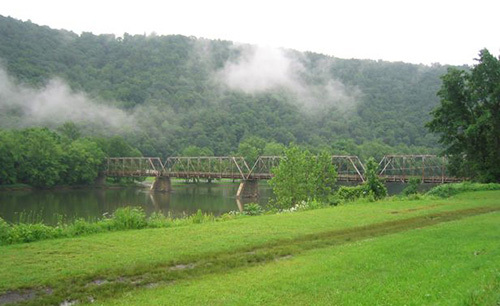 The West Hickory Bridge was the oldest active truss bridge over the Allegheny River. Today, all that remains of the bridge are a few substructure stones and a plaque on display at the Harmony Township building. The front side displayed the bridge builder, Groton Bridge Company. But his eyes would have just glazed over and he would have lost his will to live when I started prattling excitedly about supplement draft environmental impact statements and alternatives 1-272. Anyway, just the other day, I read in a newspaper (you remember, those things that give you ink stained fingers when they get all soggy between the paper box and the front door) that the state of Pennsylvania has some bridges they could sell us. Yeah, yeah. We've all had some Outside doofus look us in eye and say "I bet you could buy the Brooklyn Bridge for your access. Everyone in Manhattan already thinks Brooklyn is nowhere." Yuk, yuk, yuk. But seriously, for anywhere from $1 to $500, Pennsylvania is looking to unload some bridges to “responsible owners.” That's an easy bar to get over, according to some folks local government here is RESPONSIBLE for EVERYTHING! All Penn asks is that we don’t turn these historic old bridges into scrap metal. That’s not a problem. Here in Ketchikan we already have more scrap metal than we know what to do with. After a couple of years of steady rain, all metal turns to scrap in Our Fair Salmon City. Currently, Pennsylvania officially has 11 bridges to sell. But considering PA has some 6,000 spans, and many are rapidly aging, I think it is a buyers’ market. They've already unloaded nine old bridges in the last 20 years. Pond Eddy Bridge. 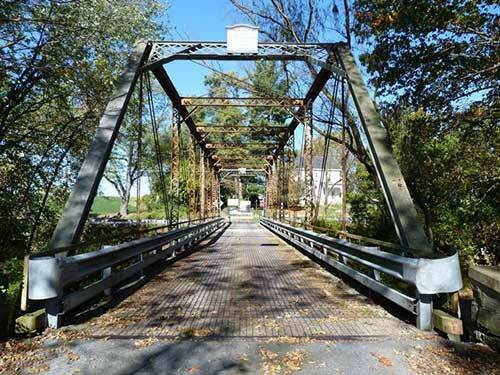 The PA Departments of General Services and Transportation are seeking buyers interested in purchasing and preserving the historic Pond Eddy Bridge in Pike County. 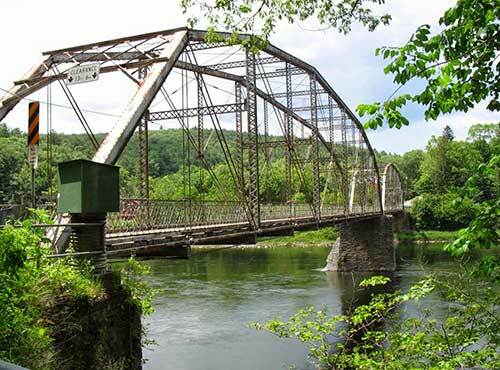 This Historic Bridge Is Slated For Demolition and Replacement By Pennsylvania Department of Transportation. The bridge is listed in the National Register 11/14/1988. Now I have lost track about just how much of Tongass Narrows we need to span to get access to Gravina. But it sure looks pretty close at Wolff Point. Why, I bet George Washington could lob a dollar coin all the way across. Heckfire, I bet he could fell a cherry tree on the Narrows and walk across. Okay, I exaggerate just a little, but I just get all verklempt talking about the Founding Fathers and how they were so awesome, all that "Don't Tread on Me" stuff. Nothing is more beloved in America than a past president. Even Millard Fillmore, who is now so beloved we name legendary concert venues after him. And put them on both coasts! Go figure. Anyway, back to Gravina Access. You know it's not that far from this here bank to that there bank at Wolff Point. I bet George could carry it with a 3 wood. Millard could do it with a driver. So all we need to do buy the West Hickory Bridge (695 feet), the Pond Eddy Bridge (252 feet) and the Craighead Bridge (134 feet) and we could just about make it, I’m sure of it. The story in the paper says that the Federal Highway Administration will even deliver the bridges, although I suspect the 30 minutes or less guarantee is not valid in Alaska. The Craighead Bridge, one-span, 134'-long, pin-connected Pratt thru truss bridge has members composed of standard built-up sections and eyebars. The bridge retains its original lattice railings and is supported on stone abutments. Open steel grid deck and steel stringers were placed ca. 1960. The bridge was fabricated in 1899 by the Pittsburgh Bridge Co. and erected by their agents, Nelson & Buchanan of Chambersburg. It is historically and technologically significant as a complete example of the popular Pratt truss design that dominated metal truss highway bridge construction in the late 19th century. The bridge has significance as one of five extant truss highway bridges from 1889 to 1899 in Cumberland County, and one of three Pratt truss bridges. The bridge documents the work of a regionally important metal truss bridge fabricator and builder. At any rate, the state of Alaska says it still has $70-$80 million “left” for Gravina Access. If it can get three slightly used bridges for $1,500 it would definitely be one of those “win, win” situations that everyone likes to jabber on and on about. And since Our Fair Salmon City is not in the Mat-Su Valley we take a rather dim view of kissing our sisters. At least most of the time. Anyway, we get the state to buy the bridges, string them together, use some of that $70 odd million to build a few ramps or whatever and there you have it. Access is ours. And no more Bridge to Nowhere because everyone knows that $1,500 is not enough of an “earmark” to all up on step about. Heck, for $70 million we could probably buy all 6,000 bridges in Pennsylvania. And then we could string them across Knick Arm and “speed” up the former Governor’s rides home. That way she won’t have to speed home and get all sideways with the State Troopers (something else that I read in the paper). Now that would be a “win, win” to Nowhere.